Wow! 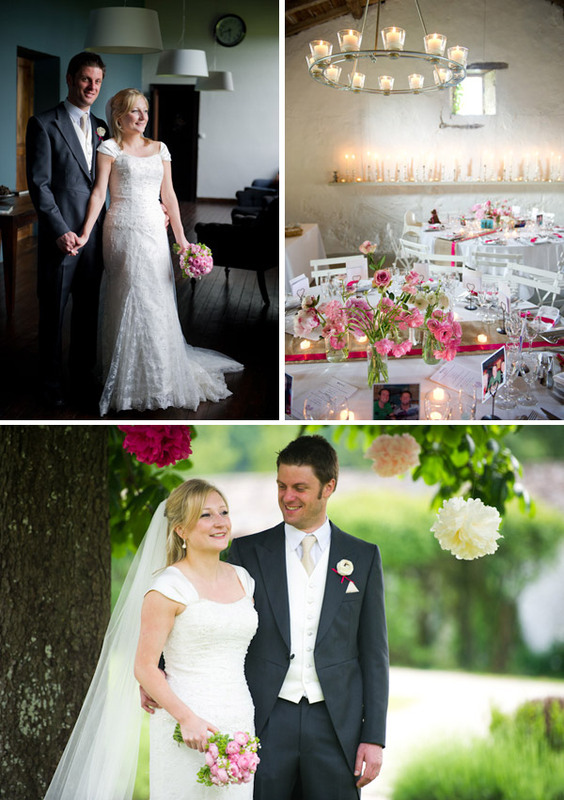 How amazing did your wedding look?! 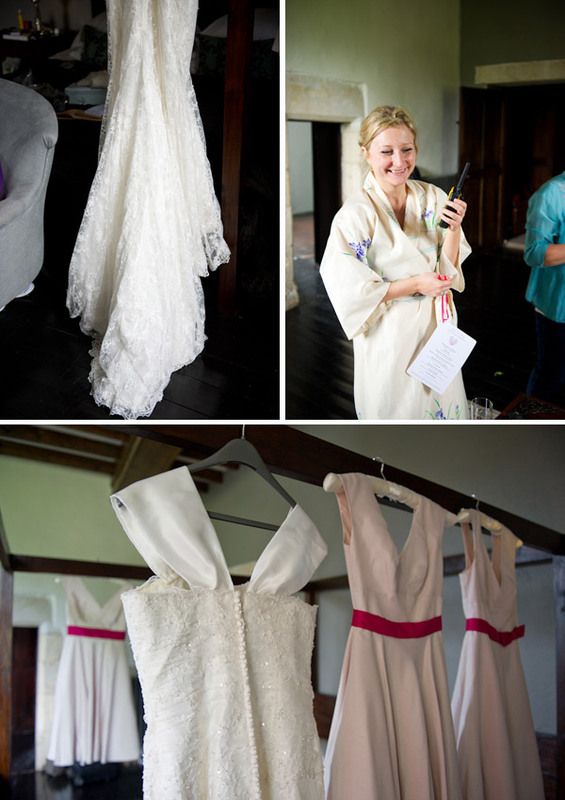 I absolutely adore your dress and the choice of bridesmaid outfits. 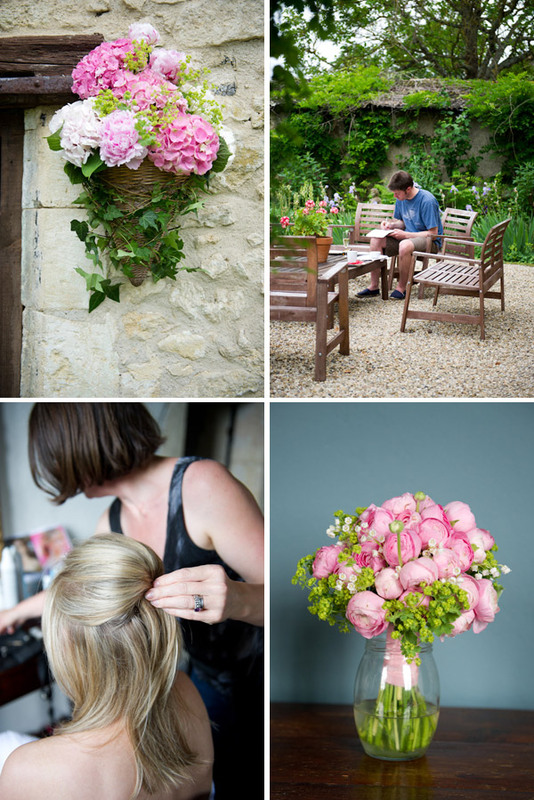 Fantastic idea with the wrist corsage – I’ve also decided to do this for my ‘best girls’ – do you have any pictures? 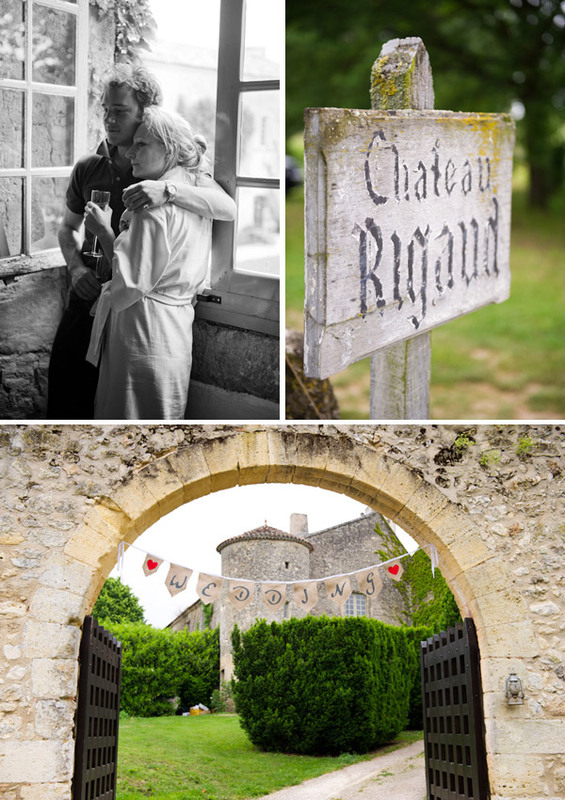 I have featured Chateau Rigaud and venue stylist Hayley’s work on my blog previously and it is amazingly enchanting. 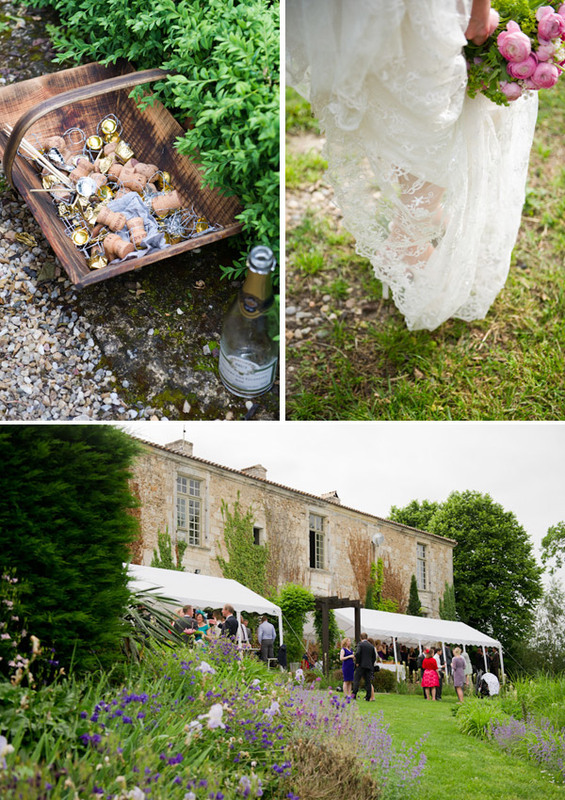 Really lovely details in this wedding. I also intend to have hessian runners at my wedding. Any tips for where these can be bought relatively cheaply in the uk? What a beautiful location! Just stunning. 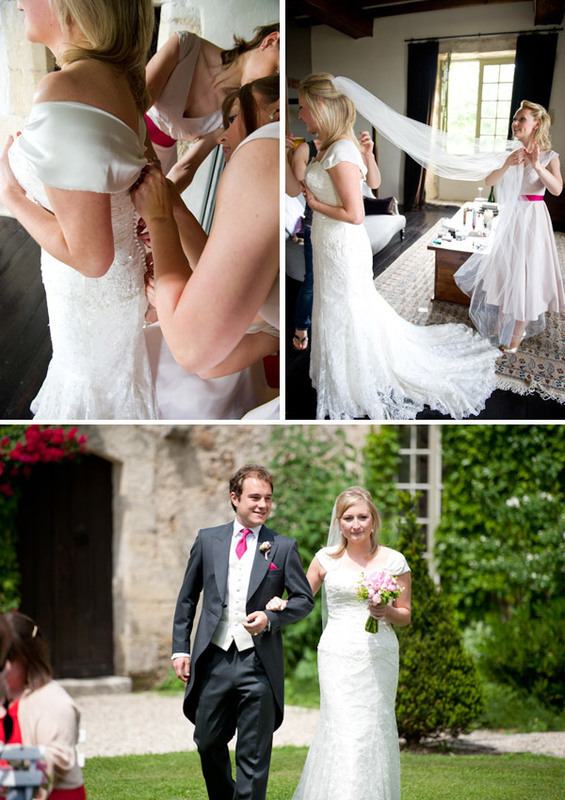 Stunning wedding, you lokk amazing, where did you get youe veil from ? Glad you are enjoying today’s French fancy folks! Wow, what a stunning location. Love the decor on the chairs, really eyecatching. 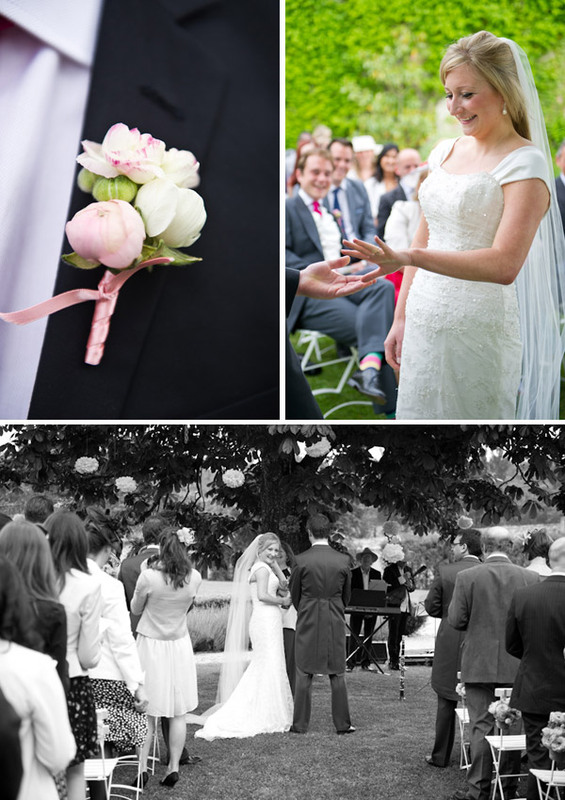 Gorgeous wedding. 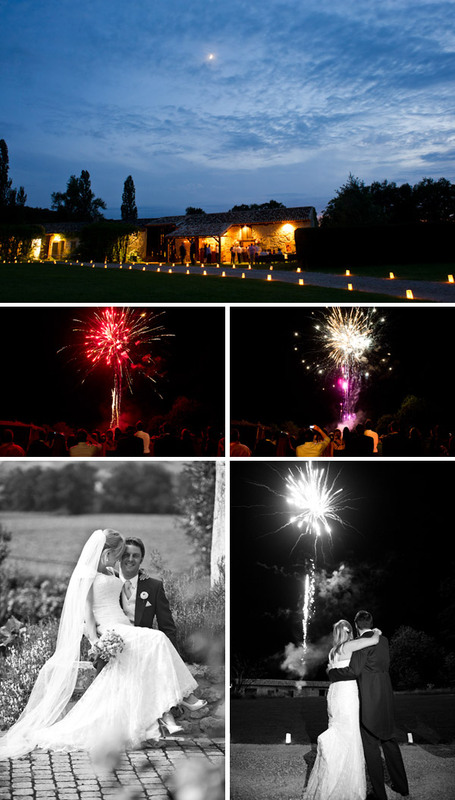 I have stayed at this amazing venue and it is the most perfect place on earth for a wedding! Will try to get a pic of the wrist corsages up for you Nicola. @Fi I made hessian runners at the weekend 🙂 We got ours in Travis Perkins, 100m for £50. I have TONS left! Where abouts are you? I absolutely adore the candles along the shelf. I am hoping to have lots of candlesticks of all kinds (am currently on the charity shop hunt!) and would be thrilled if it looked as good as this! Plus a french/english cheese ‘cake’ – my idea of heaven! This is so lovely – so intimate. 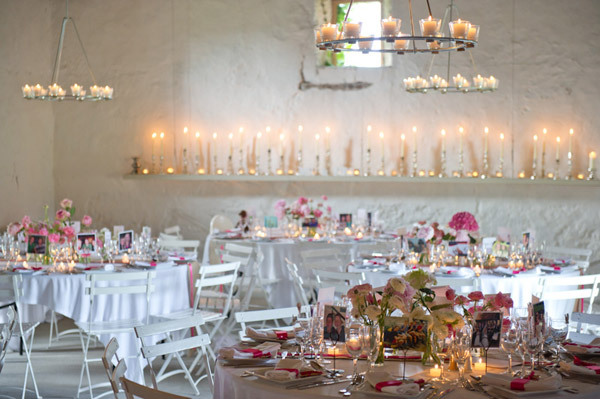 I love the mercury glass candlesticks and the venue looks just perfect! 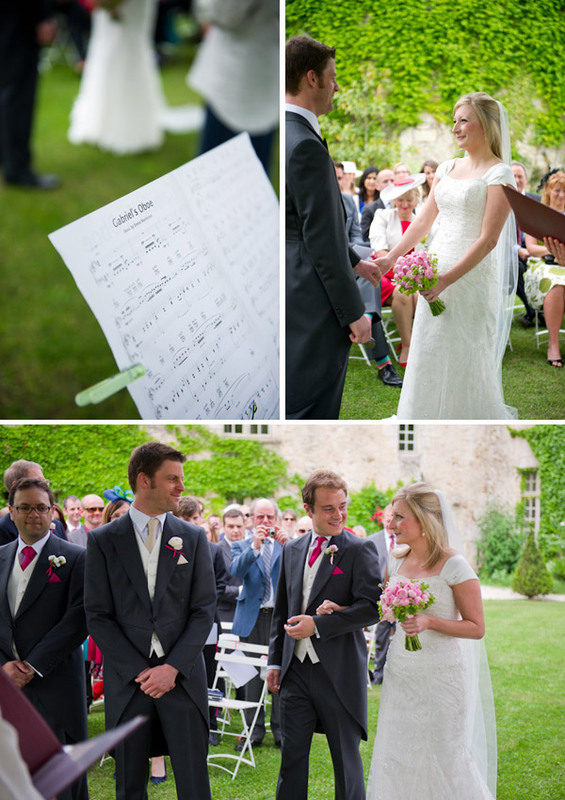 I too got married in France (Provence) six weeks ago, and is bringing back lots of lovely memories. 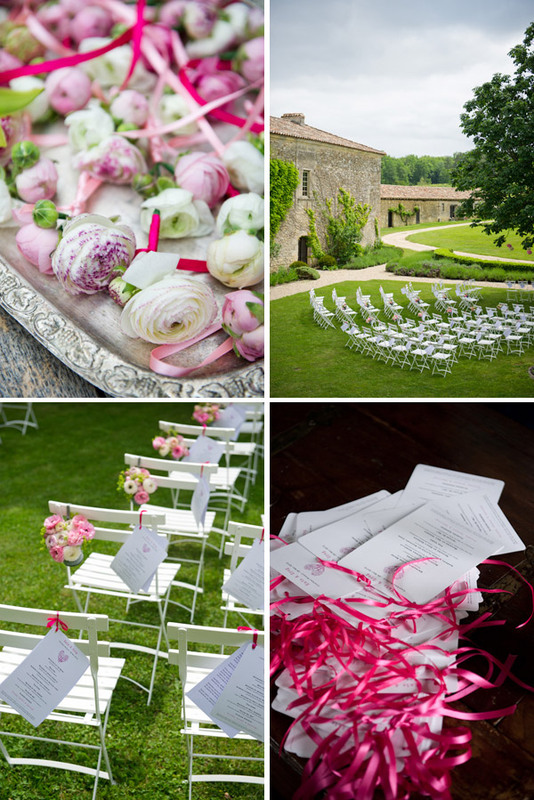 Anyone considering a French wedding, do it! Easy to get there, amazing weather, amazing food and seems a million times cheaper than UK. I’d definitely recommend Warterers Rebecca, they were great. Any tips on how to make the pompoms for the trees? The first image on this post is the first one Amy sent me in her submission. I found other places which did them but these were much better value and turned out really well. 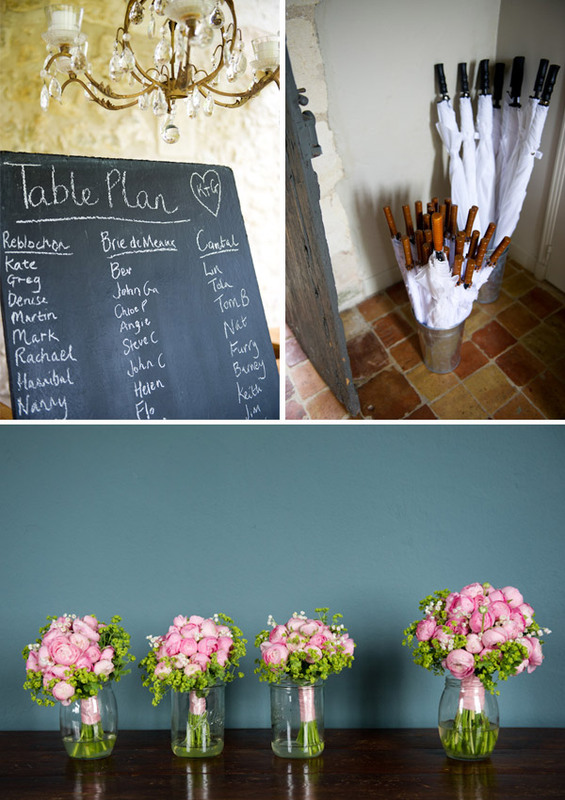 They are a bit time consuming to make up but really easy – a good job to get everyone involved in! Thank you Kate, it certainly does! You’re right, it’s excellent value. Thank you so much! Bex, we designed the stationary ourselves and just got our local shop to print them! I really liked Artcadia though http://www.artcadia.co.uk/ when I was looking around. We just decided to do our own to save money! 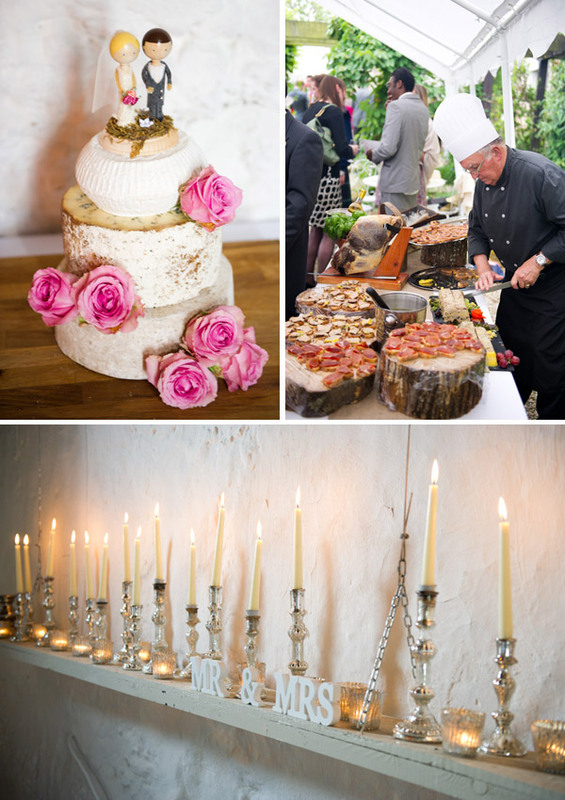 The cheese wedding cake is looks so yummy and the toppers are great. I feel hungry just looking at it! @Fi it is SO easy to cut with normal kitchen scissors and doesn’t need hemming or anything. I would be more than happy to post you some as I have so much of the stuff! Wow what a beautiful wedding. I can totally see why guests didn’t want to leave!! 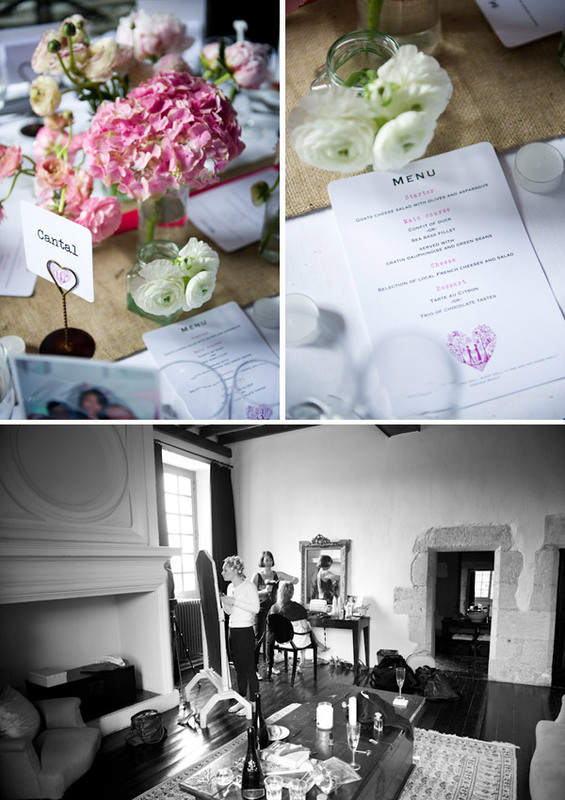 Such elegant simplicity in a stunning venue. Congratulations! That reception space is simply BEYOND dreamy! All the candles… candles can make anything magnificent. Can I ask where you got your cheese tower from please? and were the pain au chocolat’s popular in the evening?